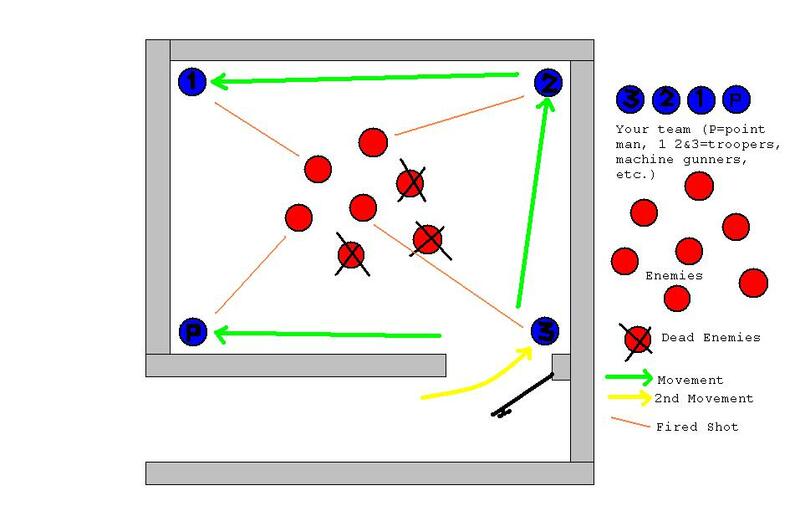 Your team should approach the door pressed against the wall (left side forward if moving right, right side forward if moving left) and your point man should stop when he is within comfortable reach of the handle, as shown. Your point man, having a firm grasp on the doorknob, should now swing the door open VERY QUICKLY. Notice: he should remain behind the door. He is NOT the first to enter the room. Blue #1 is. When the door is swung open by your point man, Blue #1 should immediately enter. From now on, everything happens in a matter of about four seconds if done properly. Your enemy will NOT have enough time to react. Right after the point man swings around the door and enters, Blue #2 comes up to position for entry right behind his (above.) 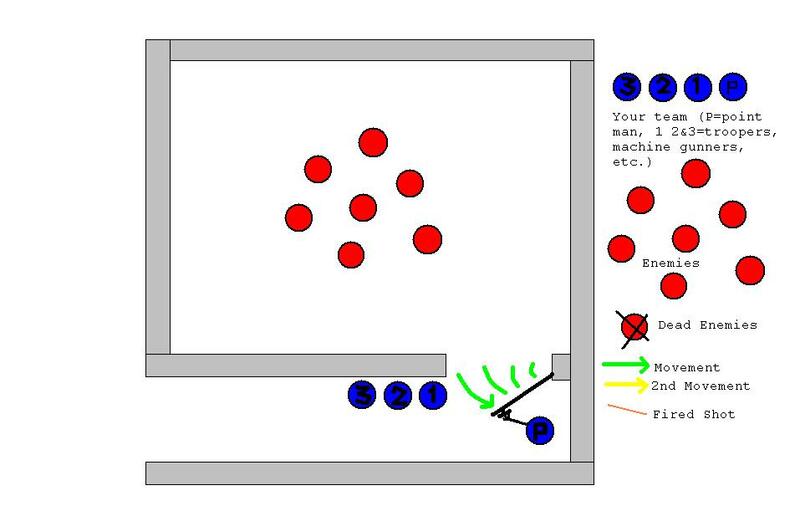 Now, Blue #1 strafes across the next wall, continuing around to the corner opposite the door, firing again at his nearest enemy. 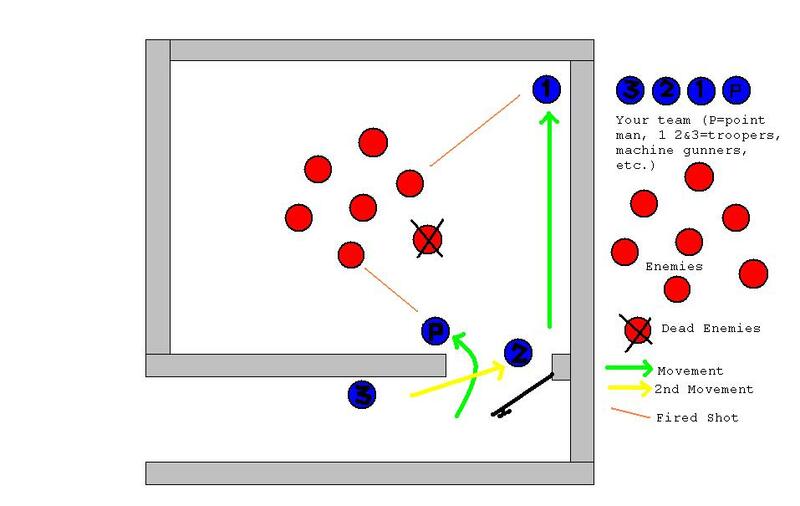 The point man strafes across the wall to the corner left of the door and fires, while Blue #2 enters, firing, and strafes across to Blue #1's initial corner, as seen below. 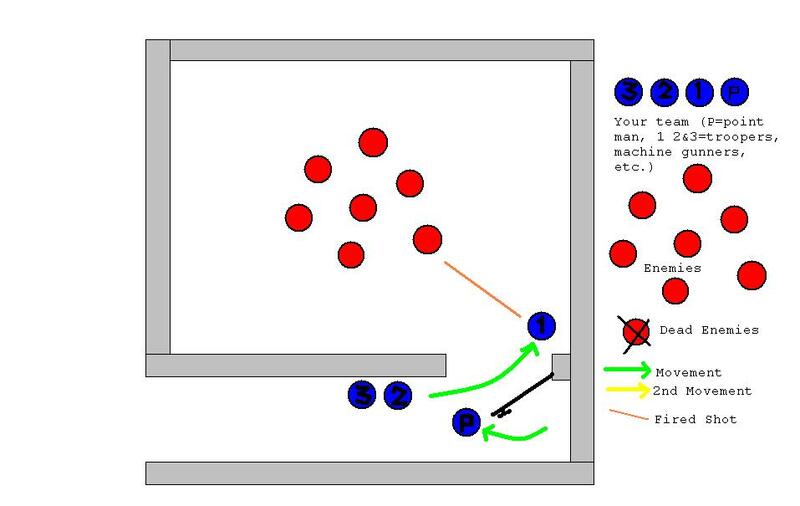 Once Blue #2 has begun to strafe across to Blue #1's initial corner, blue #3 enters and remains at the door. You now have a teammate at each corner, and they all fire one last time at their nearest enemy. 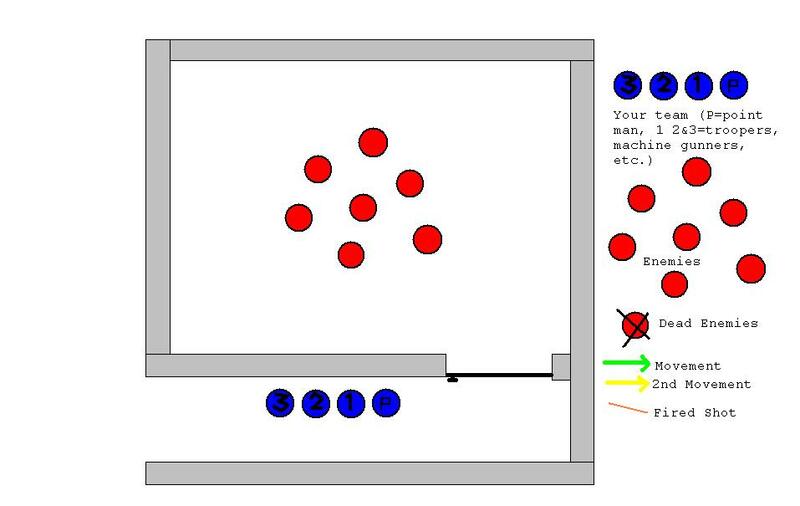 This is shown above, and the final results are shown in the final diagram below. 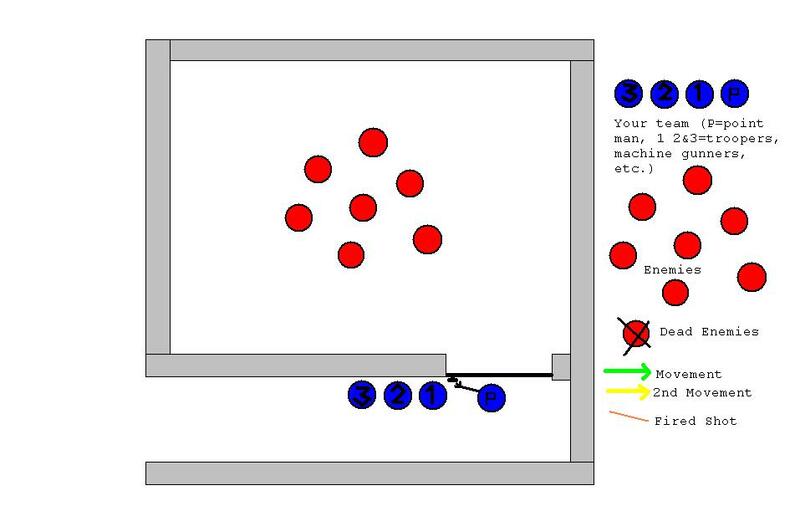 If you fire exactly as many times as mentioned here in this walkthrough, and they all hit their target, you can take out seven enemies in the room (the scenario depicted in the diagrams.) If you do not hit every time, you are, of course, able to fire again. Nothing's keeping you from doing so. If you have access to them, a blastfire, Hornet AS-6, Powerclip, or Mad Hornet could be very useful for the imminent event when one of your teammates misses. Wildfires are too much for this small job, and you run the risk of taking out a teammate. The same goes for the Mantaray. I also suggest that you do not use the "blast button" feature on the Blastfire or the Hornet AS-6, as it has the ability to accidentally take out a teammate as well.